Alfred Gilbert Dixon is the Director of the Development and Delivery Office. Alfred served as the Director General of the Sierra Leone Agricultural Research Institute (SLARI), Freetown, Sierra Leone, after leaving IITA in 2008. He worked at the Crop Science Department, Njala University College, University of Sierra Leone as a Research and Teaching Assistant (1981―1982), Graduate Research Assistant (1985―1988), and a Postdoctoral Research Associate (1988―1989) with the Sorghum Breeding Project of the Department of Agronomy, Kansas State University in Manhattan, Kansas, USA. 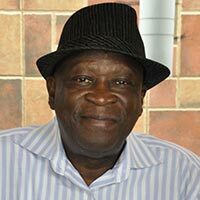 His career with IITA-Ibadan started as a Postdoctoral Fellow (1989―1999), an Associate Scientist (1991―1994), and a Scientist (1994―2000) in Cassava Breeding/Genetics. He holds a PhD in Agronomy (1988), an MSc in Genetics (1985) from Kansas State University, Manhattan, Kansas, USA, and a BSc in Agriculture (1981) from Njala University College, University of Sierra Leone, Sierra Leone.